We recently acquired a very interesting 2007-D Washington quarter struck on a manganese dollar planchet, and struck in a dollar sized collar. 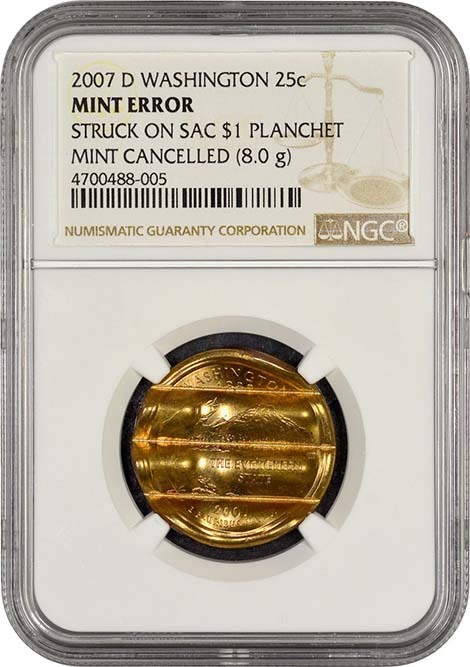 Here is how we believe it happened, and also why we believe it is highly likely (although impossible to know for certain) that the coin was struck on a 2007-D Washington dollar planchet. 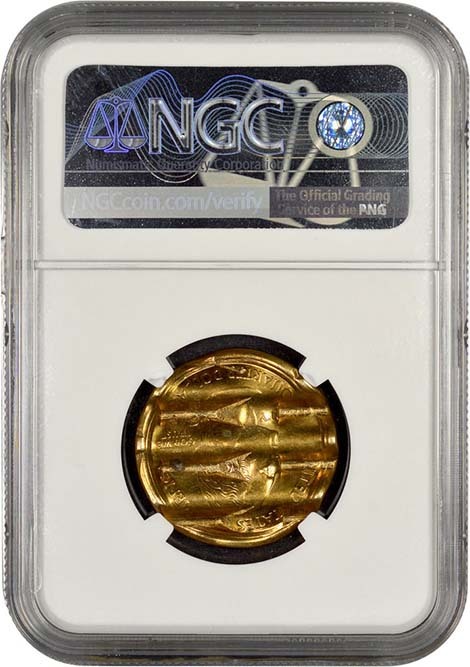 Although the NGC holder says "Sacagawea dollar planchet", it actually isn't possible to know either way. The 2007 Sacagawea dollars have no edge lettering, and neither does this coin. The presidential dollars do have edge lettering, and this coin does not—that would seem on the surface to prove that it is a Sacagawea planchet. However, because edge lettering is added to the presidential dollars after they are struck, that is not proof. Instead, what I think may very well have happened is that this error was made when a 2007 Washington quarter obverse and reverse die were installed in a press for Washington presidential dollars. You could conjecture that it might have been the Washington dollar since the same name "Washington" for the dollar and the quarter might have confused the press worker if the dies were somehow marked "Washington". Both would also be "2007", and perhaps the dies were marked something like "2007-D Washington" on the quarter dies, and might not have stated denomination (or the press worker might not have noticed the denomination designation.) The press then struck some or an entire bin of coins with quarter die obverse and reverse, and a Washington dollar coin planchet and collar, then the press worker went to move the coins to have the edge lettering applied but noticed the mistake. Instead of them going through the edge lettering machine, the coins were simply all sent to be waffled and thereby destroyed, resulting in this coin. We'll likely never know, but the scenario seems entirely plausible to me, and in fact most probable, that it was actually a 2007 Washington dollar press that these 2007-D Washington quarter dies were installed on. Additionally, I checked and of interest the Washington dollars were released in February 15th, 2007. Washington quarters were released April 2nd, 2007. The coins almost certainly were being struck at the same time, further proving the likelihood that a mixup of this kind occurred since both designs' striking was concurrent. Also, the newness of the presidential dollar series doubtless created some confusion and adjustments at the Mint, furthering the likelihood of a mix up of the quarter/dollar dies as they refined their manufacturing processes. The same error occurred as well in 2000, when a Maryland quarter set of dies were installed in a press striking Sacagawea dollars, creating a "quarter on Sacagawea planchet and with a Sacagawea collar die." Since one of the 3 dies (hammer, anvil, and collar) is incorrect, the collar die in this case, it is a mule, as is the 2007-D Washington quarter on manganese planchet, although not the type of mule you'd typically expect for a "mule" error. It is a "collar mule."